The president’s blueprint for lowering drug prices, now 100 days into its implementation, is working, Health and Human Services Secretary Alex Azar said. Speaking to reporters on Aug. 21, he attributed a year-on-year 60 percent decrease in price hikes for branded drugs to the “unprecedented” number of actions the administration has taken to cut drug prices. Azar also said the American Patients First plan, “the Trump administration blueprint to lower drug prices and reduce out-of-pocket costs,” which was introduced in May, has achieved a 50 percent decline in generic and branded drug prices compared with the same time last year. Thirteen drug companies have committed to freezing prices for the rest of 2018, four have canceled planned increases, and two have decided to lower prices or roll back increases, HHS said in its announcement. It’s unclear which companies HHS is referring to. In July, Pfizer announced that it would freeze price increases following a conversation with President Donald Trump. Novartis announced a similar move a few days later. “Right now, in a very dynamic environment in the United States … we view it as the prudent course,” Novartis CEO Vasant Narasimhan said at the time. It could be too early to tell how sustained these prices decreases will be, as many manufacturers often raise prices starting in January. HHS has been working within its ability on reforms to the system, but Azar also called on drug manufacturers and Congress to do their part to bring down drug prices. The Centers for Medicare and Medicaid Services (CMS) has already put health insurers and pharmacy-benefit managers on notice that it is unacceptable to include “gag clauses,” which prevent pharmacists from telling customers about lower-cost alternatives, in their contracts. It is already a policy that Medicare Part D patients can’t pay for more expensive drugs when there is an equally effective and cheaper alternative. CMS also announced a rule change earlier this month that allows Medicaid Advantage plans to negotiate for better drug prices. The rule change allows private insurers and pharmacy-benefit managers, which work with insurers to negotiate drug prices with manufacturers, the ability to negotiate prices for Medicare Plan B drugs, which are often administered at a hospital or in a doctor’s office but include some outpatient drugs as well. 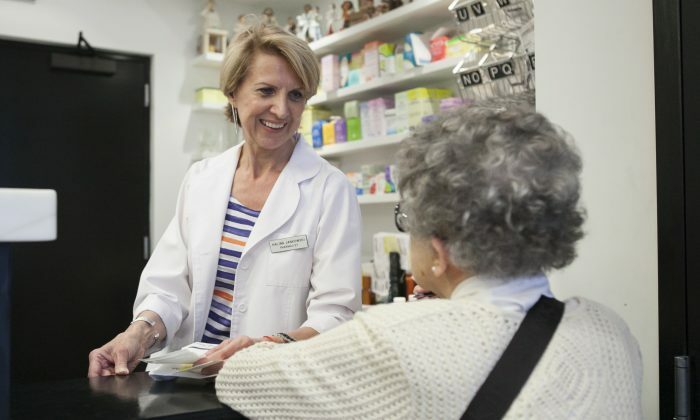 As part of that announcement, CMS said half of the savings that result from these negotiations with drug manufacturers must be passed on to the almost 20 million seniors enrolled in Medicare Advantage plans. The Trump administration has also approved a record number of new generic drugs, which have the same active ingredients as branded drugs, but are usually less expensive. In July, the FDA approved 126 generics, the highest number for any single month in history, according to HHS. In June, HHS approved a waiver for Oklahoma Medicaid that would allow the state to pursue a value-based rebate program with drug manufacturers. If the drugs aren’t effective, the state could get money back in the form of rebates. Azar has said he is also in favor of importing drugs when drug shortages or price hikes in the U.S. make it cheaper to import the same drug from another country. Last month, he created a working group to look into these short-term imports; they have already held meetings.